Successfully Added FlyDiGi Wee Mobile Game Controller - Stretchable Handle, Bluetooth Support, Built-in Battery, Anti-Slip Grip (Blue) to your Shopping Cart. The 300 mAh battery size is perfect for gaming as it is long lasting. This controller is compatible with Android 4.4 to the latest version. It has a stretchable handle that makes it a perfect fit for nearly all smartphones. Plenty of buttons to meet the requirements of expert gamers. The FlyDiGi designed a wonderful game controller that will enhance your gaming experience. 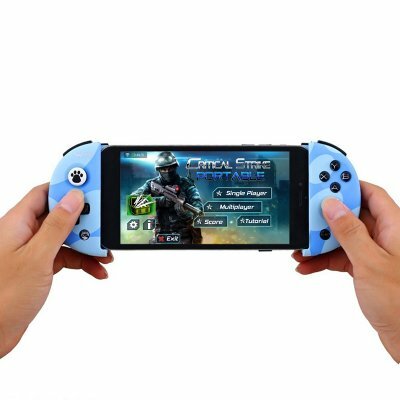 This gaming controller has a 3-layer structure that can be adjusted according to the mobile phone. The joystick thin and comfortable to handle and will fit a range of phones from 75mm to 162mm in length with a thickness under 9.2mm. The controller is designed keeping in mind the unique needs of gamers. The 14 button controller makes it easy to control your character. This is the perfect choice for expert gamers because it is designed for their accessibility and convenience. Moreover, the ABXY crystal key has translucent and clear buttons. It has 3-layered structure design that is strong yet lightweight. The buttons are shaped in N-layout that reduces the interference between the keys. The FlyDiGi controller can be used for various games that are for Android 4.4 and above. The Wee joypad has a built-in 300 mAh lithium battery that can last for a long time on one charge and brings a working time 80 hours, the battery takes just 4 hours to charge. This controller has Bluetooth BLE 4.0 function that will connect the joystick to the mobile. It will enable you to have a strong connection without any interference. This is a great choice for gamers as there is no hassle of wires. The joypad will last for a long time as there is no wire that can get damaged. Therefore, Whether you are an expert gamer or a beginner, this controller is perfect for the enhanced gaming experience. The FlyDiGi Wee Mobile Game Controller comes with 12 months warranty. Brought to you by the leader in electronic devices as well as wholesale Bluetooth gadgets and mobile phone accessories..